A recursive maximum-likelihood (RML) algorithm for channel estimation under rapidly fading channel and colored noise in a multicarrier code-division multiple-access (MC-CDMA) system is proposed in this paper. A moving-average model with exogenous input (MAX) is given to describe the transmission channel and colored noise. Based on the pseudoregression method, the proposed RML algorithm can simultaneously estimate the parameters of channel and colored noise. Following the estimation results, these parameters can be used to enhance the minimum mean-square error (MMSE) equalizer. Considering high-speed mobile stations, a one-step linear trend predictor is added to improve symbol detection. Simulation results indicate that the proposed RML estimator can track the channel more precisely than the conventional estimator. Meanwhile, the performance of the proposed enhanced MMSE equalizer is robust to the rapidly Rayleigh fading channel under colored noise in the MC-CDMA systems. The direct-sequence code-division multiple-access (DS-CDMA) technique has already been successfully implemented for third generation (3G) mobile communication systems [1–3]. Its utilization of channel bandwidth is efficient. Orthogonal frequency division multiplexing (OFDM) is a parallel transmission technique and has been adopted in IEEE802.16 [4, 5]. It can overcome the delay spread and spectrum efficiency in wireless communication systems. The idea of integrating the merits of both OFDM and CDMA schemes, known as multicarrier-CDMA (MC-CDMA), has attracted significant research interest recently. The MC-CDMA system is a candidate technique for the next generation mobile communication system. The MC-CDMA system divides the available bandwidth into a large number of narrow subchannels [6–8] and spreads each data symbol in the frequency domain by transmitting all the chips of a spread symbol at the same time, but in different orthogonal subchannels. One of the properties of multicarrier transmission is that the channel gain of each subchannel is different from the others. Since the MC-CDMA systems spread transmitted symbols in a nonflat fading channel, the inner product of different spreading codes will no longer be zero. This leads to the loss of orthogonality between different users. The multiple access interference (MAI) is introduced and the performance will be severely degraded in this situation. In order to preserve the orthogonality between different users, channel impairment should be estimated precisely and equalized efficiently. Earlier works [9–11] for MC-CDMA detectors made the assumption that the channel is perfectly known at the receiver. Recently, the impact of channel-estimation errors on the performance of MC-CDMA detectors has attracted much interest, and different approaches have been adopted for channel estimation and tracking. The pilot-symbol-aided channel-estimation methods in both time and frequency domains have been proposed [12–14], where the estimated channel coefficients are then obtained through the two-dimensional (2D) linear filtering. Other approaches [15, 16] consider an explicit channel estimation based on channel sounding in which a "train of pulses'' spaced by the maximum delay spread of the channel is transmitted instead. A multiple channel model, which includes several possible channel models based on the different ranges of Doppler frequencies (or mobile velocities), is constructed to treat the time-varying fading channel . In addition, a decision-directed channel estimation in the frequency domain using Kalman-based filter has been proposed . Although the MC-CDMA scheme is superior to noise and interference suppression, some papers [19, 20] have indicated that the narrowband interference (NBI) could affect its performance. The bandwidth of NBI does not exceed one subchannel. NBI is caused by intended jamming and some narrowband services. It can be considered as one kind of colored noise which has nonflat power spectral density and has been analyzed in [21, 22]. NBI can be eliminated by notch filters in the CDMA systems [23–27]. The channel parameters are then estimated after despreading. But in the MC-CDMA systems, the objective of channel estimation is to make the gain of each subchannel equal for despreading. That is, the channel estimation and equalization should be done before despreading. Therefore, the notch filter will destruct the orthogonality and is not feasible for MC-CDMA systems. The frequency-domain channel-estimation methods in the MC-CDMA systems will fail if the channel contains colored noise. It is because the colored noise can be considered as a white noise in each subchannel but with different power. When those pilot subcarriers suffer from noise with large power, the estimation results are no longer reliable and the performance degrades due to the loss of orthogonality between different users. Conventional estimation methods  are also unsuitable for channel estimation under colored noise because they will lead to a biased estimate due to the dependence between the residue and regression signal. A channel-estimation algorithm for MC-CDMA systems under colored noise is proposed in this paper. It is derived based on the recursive maximum likelihood (RML) algorithm. It can jointly estimate the parameters of channel and colored noise in the time domain. A moving-average model with exogenous input (MAX) is used to describe the dynamics of channel and colored noise (or NBI). The colored noise is modeled as a moving-average (MA) process with a driving white noise. Since the driving white noise is unavailable, it is difficult to estimate the parameters of colored noise in the real time for precise channel estimation. The proposed method uses the estimated residue instead of the driving white noise to overcome this problem. After the channel parameters are estimated, they are fed to the minimum mean-square error (MMSE) detector to improve the performance of equalization. The most important contribution of the proposed method is that the channel impulse response (CIR), the parameters of colored noise, and the power of the driving noise in the MC-CDMA systems can be simultaneously estimated in real time. Since the proposed method works in the time domain, it can significantly reduce the number of the estimated parameters compared with the methods in the frequency domain. For example, the number of the estimation algorithms in , which works in the frequency domain, should be 512 if there are 512 subchannels. Its computation algorithm is more complicated. But only an algorithm is needed for the channel estimation, no matter how many subchannels the MC-CDMA system has. However, the channel-parameter estimation in the time domain is easily deteriorated by colored noise. The proposed RML algorithm can overcome this problem with a simple scheme. Based on the estimation results, an enhanced MMSE equalizer is employed for symbol detection. The performance is demonstrated by the computer simulations. This paper is organized as follows. In Section 2, the MC-CDMA system is described. The proposed RML channel estimator is introduced in Section 3. The decision-directed channel-tracking process and the design of enhanced MMSE detector for the proposed method are presented in Section 4. The computer simulations of the adaptive MC-CDMA detector are presented and compared in Section 5, and the conclusions are summarized in Section 6. In what follows, denotes the transpose of , and denotes the Hermitian of . denotes the circular convolution. This section describes the models of the transmitter and receiver in an MC-CDMA system with subchannels and users. The th multicarrier block symbol (duration ) for user is formed by taking symbols in parallel, which are spread by the user's spreading code with length . Thus, the spread symbols are placed into available subchannels. The transmitter's block diagram is shown in Figure 1. In the rest of this paper, for simplicity of notation, we concentrate only on the case where each user transmits one symbol ( ) in each MC-CDMA block symbol. The transmitted symbol is simply represented as for user . Therefore, the total number of subchannels is . Block diagram of the MC-CDMA transmitter. for , where the subscript and superscript denote the th signal block with a guard interval. Thus, the total MC-CDMA symbol duration is , where is the guard interval duration and is the sampling time. The value of is larger or equal to the maximum multipath delay spread of the channel, and is small in respect to (a useful OFDM symbol duration) to limit the spectral efficiency loss. Because the term , due to colored noise, may be large at some and , the frequency-domain pilot-aided channel estimation for is not reliable if the interference power is high at that subchannel. Therefore, it is not easy to estimate channel accurately from the received signal in the frequency domain. Furthermore, if the number of subchannels is large, many parameters need to be estimated. An RML method is proposed to jointly estimate the coefficients of channel and colored noise in (7) and (8) by the time-domain method via a pseudoregression scheme in the next section. An MMSE detector is designed based on the estimated coefficients to compensate the effects of the colored noise. The description of the transmission system in (12) is called an MAX model. It is a simple form of ARMAX model . Since the driving noise is white, the covariance matrix of the driving noise is and assumed to be unknown at the receiver, where . The parameters should be estimated in the colored noise case to obtain accurate channel model, that is, the parameters of the channel model and colored noise will be simultaneously estimated from (12). However, the regression vector contains noises , which are unavailable and should be replaced by pseudoregression vector in the sequel. Therefore, the maximum-likelihood parameter estimation can be obtained. But there are still two problems. One is that the noise components of that is, are unavailable. The other is that the parameter estimation in (19) is in block form, which is not suitable for real-time design in the MC-CDMA communication systems. A recursive parameter estimation for (19) and an estimate for noise sequence are necessary in this situation. Since the wireless mobile channel is time varying, the channel model must be tracked continuously at the receiver for the correct data detection. The proposed RML algorithm in the previous section assumes the transmitted signal can be obtained. This is only true in the training mode, but the transmitted signal is unknown for receiver in the tracking mode. Therefore, the detected data will be fed to the RML estimator to replace the transmitted signal for channel estimation. This is the so-called decision-directed channel estimation. 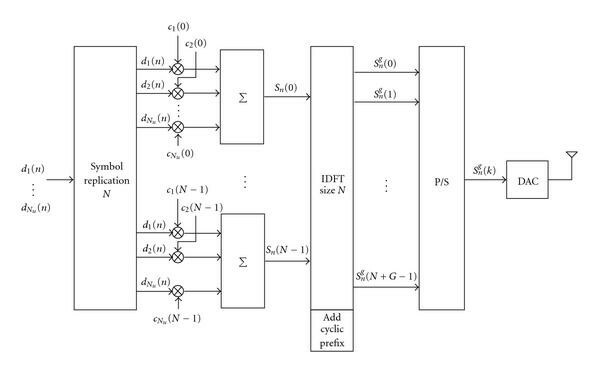 In this subsection, an adaptive decision-directed channel-estimation algorithm in the time domain is developed. The conventional channel-estimation methods for multicarrier transmission systems are equipped with pilots in the frequency domain, which is spaced by coherence bandwidth. When colored noise or NBI exists, the noise can be considered as white noise but with different powers in each subchannel after DFT conversion at the receiver. As a result, the pilot-symbol-aided channel-estimation methods [12, 13] are no longer reliable because some pilot subcarriers suffer from white noise with large power. Another drawback of these methods is the occupancy of bandwidth, which is a valuable resource for the service providers. Decision-directed channel tracking is a solution to this problem since it does not need any bandwidth and has a good performance in the well-known channel . But the parameters of channel and colored noise are usually time varying. Therefore, the proposed RML method is modified here for channel tracking. The initial condition is equal to which is the latest channel estimation of the previous MC-CDMA symbol and is the number of the recursion in one symbol duration. In what follows, is equal to . Block diagram of the decision-directed channel-tracking algorithm. Since the transmitted signal is unavailable for receiver in the tracking mode, the regenerated signal from the detected data in (25) is directly replaced for parameter tracking. In this way, the current channel-parameter tracking is done after the current data detection. However, the MMSE data detection needs to have the current channel parameters. This is a delay problem of the decision-directed channel-tracking scheme. A conventional decision-directed scheme  adopts the previous estimates for the current MMSE data detection , based on the assumption that the channel variation is slow. However, when the channel variation is fast, the previous estimates will not be suitable for the current data detection. In order to design MMSE detector at time , the parameter must be predicted from the previous parameter-estimation results to overcome the delay problem of the decision-directed channel-tracking scheme. Thus, a linear trend predictor is developed to predict one-step ahead channel for improving the performance of data detection in the following subsection. Performance of the MMSE detector can be improved with the reliable channel-parameter prediction, and so the one-step parameter prediction in (32) will be used for MMSE detector with a decision-directed channel-tracking scheme in the sequel. The parameters predicted by the RML-based tracking algorithm in association with the one-step linear trend predictor are used for the MMSE detector. Since the RML-based tracking algorithm can also estimate the parameters of colored noise, the performance of MMSE detector could be enhanced with this information. In consequence, the proposed method will have better performance than the conventional MMSE detectors with the use of white noise in each subchannel. 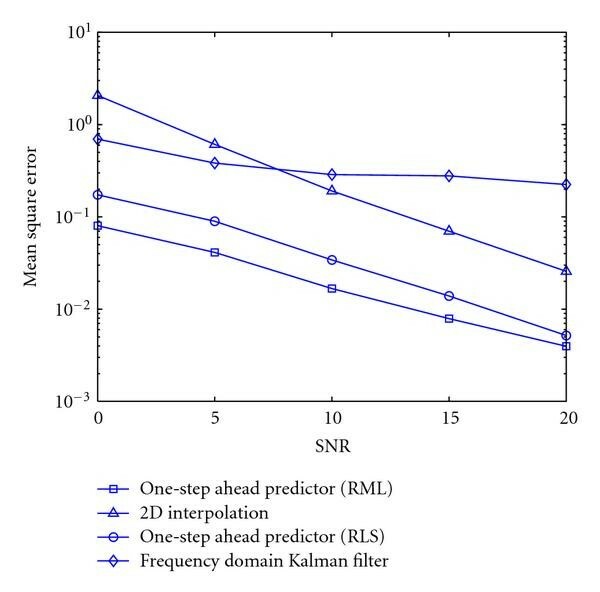 The optimal MMSE detector is obtained by using the proposed RML-based channel-tracking algorithm in association with the one-step linear trend predictor as shown in Figure 2. Finally, the merits of the proposal adaptive decision-directed channel-estimation method are listed in Table 1. Summarization of the merits of the proposed scheme. where denotes the sign function of a decision choice. Extensive computer simulations are given to demonstrate the performance of the proposed RML channel estimator. Before presenting the simulation results, the parameters of the simulated MC-CDMA systems are described in the following. Table 2 lists the power delay profile in the urban area with the RMS delay . If the coherent bandwidth is defined as the bandwidth over which the frequency correlation function is above 0.9, the coherence bandwidth is approximated to . The central frequency is 1.8 GHz in the MC-CDMA system. The total bandwidth is 1.024 MHz which is divided into 512 subchannels. The subchannel spacing is then kHz. An additional 8 guard interval duration is used to provide protection from ISI due to channel multipath delay spread. The length of the adopted Walsh-Hadamard code is chips. Thus, the MC-CDMA system can support the maximum number of active users . It is also assumed that the channel remains approximately constant during one MC symbol period. In the following simulations, the data modulation scheme is QPSK. Power delay profile in the typical urban area. Performance of the proposed method is compared with other methods in several situations. The velocity is 10 km/hr (the fading rate ) in this simulation. The proposed method without one-step predictor is used in this situation. 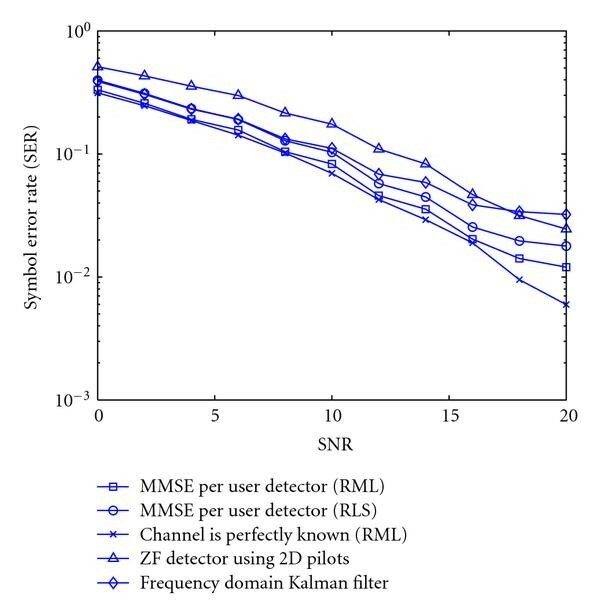 The symbol-error rate (SER) versus signal-to-noise ratio (SNR) is illustrated in Figure 3. It can be seen that the SER of the MMSE detector with perfect channel estimation is a lower bound. In the 2D pilot-symbol-aided channel estimation , the spaces between pilots in the time domain are chosen according to coherence time  if the coherent time is defined as the time over which the correlation function is above 0.5. The spaces between pilots in the frequency domain are chosen based on the coherence bandwidth . A frequency-domain channel estimator introduced in  is Kalman filter with a decision-directed scheme. Since the frequency-domain channel estimator has no immunity to colored noise, its performance is the worst of the four methods. The conventional RLS can estimate the channel parameters but not the parameters of the colored noise. Therefore, it cannot achieve the MMSE detector and its performance is worse than the proposed method. The mean-square error (MSE) versus SNR is presented in Figure 4. 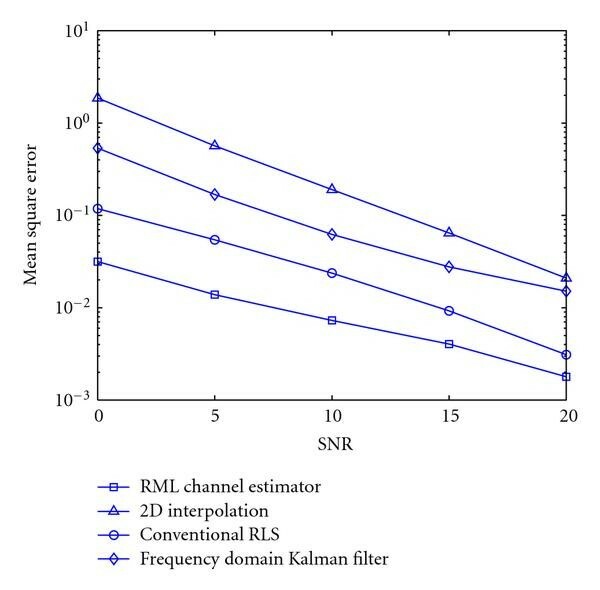 The proposed RML estimator has the lowest MSE, and so its performance shown in Figure 3 is very close to the performance with the perfectly known channel. Symbol-error rate (SER) for different channel-tracking methods in urban area. MSE of different channel-tracking methods as v = 10 km/hr ( f d T = 0.0086) in urban area. When the mobile station moves with high velocity, the channel will vary significantly in a symbol duration. The conventional decision-directed methods will fail in this situation because all of them feed the previous estimates to the MMSE detector for current detection. Based on the decision-directed RML-based channel-tracking algorithm, we further design a one-step channel predictor in Section 4 to overcome the delay problem. 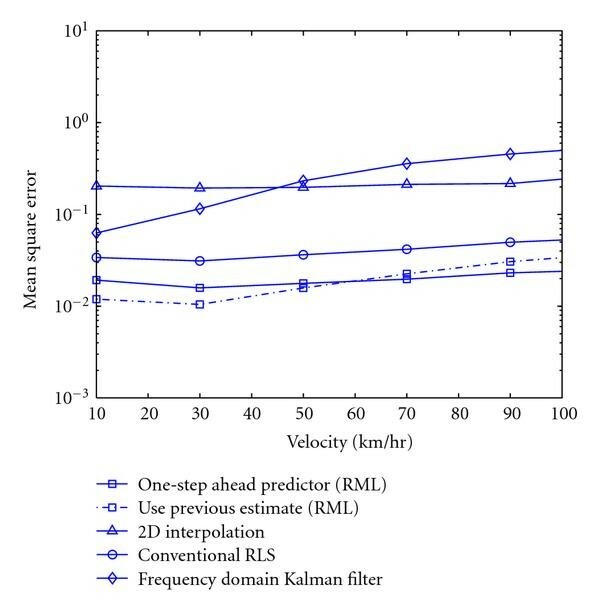 The SER and MSE of channel tracking using different methods with and without a one-step predictor are compared in Figures 5 and 6, in which the velocity 60 km/hr ( ) is considered for the design procedure. It is obvious that the proposed RML-based tracking method in association with a one-step channel predictor has the most accurate prediction of the current channel for current data detection when the channel is fast fading. Therefore, the SER of the proposed method is the lowest. 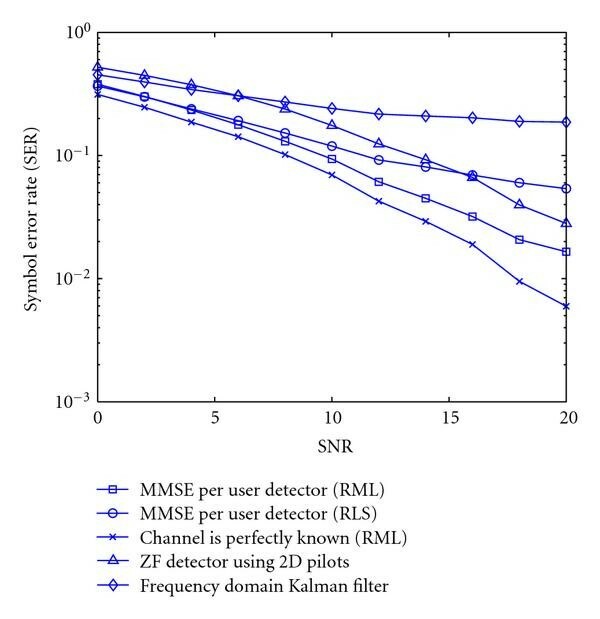 When the SNR is below 8 dB, the MSE and SER of the frequency-domain Kalman filter are worst because it feeds the previous estimates to the MMSE detector. Symbol-error rate (SER) for different channel-tracking methods as v km/hr ( f d T = 0.0516) in urban area. MSE of different channel-tracking methods as v = 60 km/hr ( in urban area. The performances of different estimation methods are compared when the mobile station moves at different velocities with dB, as shown in Figure 7. The proposed method without one-step predictor has the best performance with slow velocity because the channel variation is slow. However, when the mobile moves with high velocity, the proposed method with a one-step channel predictor has the most accurate prediction of current channel for the current MMSE detection. MSE of channel tracking versus speed of user. From these simulation results, the MMSE detector with the proposed time-domain RML-based channel-tracking algorithm and the one-step channel prediction can significantly improve the performance of MC-CDMA under the fast fading channel and colored noise. They are useful for practical applications in the MC-CDMA communication systems. This work has presented a channel-estimation method and an enhanced MMSE detector for an MC-CDMA system under the rapidly fading channel and colored noise. The proposed RML method can simultaneously estimate the parameters of channel and colored noise, and the variance of driving noise in the time domain with a simple scheme. The MMSE detector will be enhanced by using the estimated parameters. The proposed channel-estimation method can work in the time domain because the parameters of colored noise are estimated by using the residues generated in the process of the recursive channel-estimation algorithm. Another advantage is that the number of estimated parameters in the time domain is less than that in the frequency domain. Thus, the computational complexity can be significantly reduced by decreasing the number of estimated parameters. The decision-directed RML-based channel-tracking algorithm can reduce occupancy of the available bandwidth. Furthermore, a one-step linear trend channel predictor is proposed to feed more accurate channel parameters to MMSE detector for improving the current data detection. The MSE of the proposed channel-estimation scheme is improved and the SER is very close to the case with the perfectly known channel parameters. The proposed scheme provides better performance than the other methods for MC-CDMA systems under the rapidly fading channel and colored noise from simulation. It is because none of the conventional channel-estimation methods can estimate the parameters of colored noise in real time or they have other drawbacks, that is, occupying of large bandwidth, inaccuracy in the fast fading channel and under the colored noise, and so forth. Therefore, the proposed decision-directed RML-based channel-tracking method with a one-step linear trend channel predictor is very useful for MC-CDMA systems over rapidly Rayleigh fading channel with colored noise.